Do you know the kind of mom who makes all celebrations special? Whether it is through a St. Patricks' Day treasure hunt, or an amazing homemade birthday cake? Britney is that kind of mom. She always has fun and creative ideas for taking the ordinary and making it extraordinary. Her playroom is no exception; we are thrilled she agreed to give us a little peek inside. What elements have worked best in your playroom? Bins, bins, and more bins. I crave organization. I'm not very organized as a person, so it's a constant mental and emotional struggle, but I continue to buy bins and attempt complete organization. I really try to make sure every toy has a place that makes sense to the kids for easy clean up. My favorite organization purchases so for have been the Umbra Crunch Cans from The Container Store. My kids are obsessed with stuffed animals and they are perfect for storing them. I have also loved our big chalk board wall. It's a lot of drawing space, without leaving a big paper trail and it is easy to clean up with hot soapy water. What are your top 5 favorite toy purchases to date? 1- Janod story boxes and matching train sets. My kids play with these for hours and they work perfectly with the IKEA train set tracks. 2-The Hape Round About Marble Railway. Also a toy my kids will play with for hours and they can build all sorts of tracks. 3-The Learning Journey puzzles. We have, Who am I?, Memory, and Sequencing. They are made to last and my kids have always loved playing with them. 4- Schleich animals. These are way too expensive for me to justify most of the time, but I have bought some here and there and the kids have received a bunch as gifts, lucky for us. They are so much nicer than other plastic toy animals and make a really great collection. 5- Our child size 30 key wooden toy grand piano. My kids play it all the time. It keeps them off the big piano for now and they have been able to learn some simple songs on it it already. I can't find the one we have but this is similar. I also have to add the obvious ones like Legos, Star Wars figurines and Hot Wheels. These are go to toys for my boys. What are some of your favorite toy brands? I love all things Hape and Janod. They tend to be more expensive than I like, but there are always deals to be found on Amazon or Jet.com. Their toys are well made, usually wood and have really fun designs. And the best part is my kids gravitate to them. I like a lot of Melissa and Doug and Ikea toys for similar reasons. What is your biggest toy purchase regret? Target dollar section toys! I have a prize bin that I collect small toys and things in that my kids can win for doing random things. I used to go straight to the dollar section to gather toys and a year later I had junk toys taking over toy bins and my floors. Huge waste. That being said, there are still little gems to be found there. I've just become much more selective. How do you control toy creep? About every 6 months I make the kids go through the playroom with me and we clear out toys that are broken, never or rarely played with or are just generally worn out. We take toys that are still in decent shape to our local donation center. I am too lazy to do any sort of rotation. Sometimes this process can be traumatizing for some of my kids because they hate letting go of things, but I think it is a good learning experience to get rid of unused things, help them to not get overly attached to possessions, and to live simpler and keep order to our house. In the end, they always feel a sense of accomplishment when they let go of things. 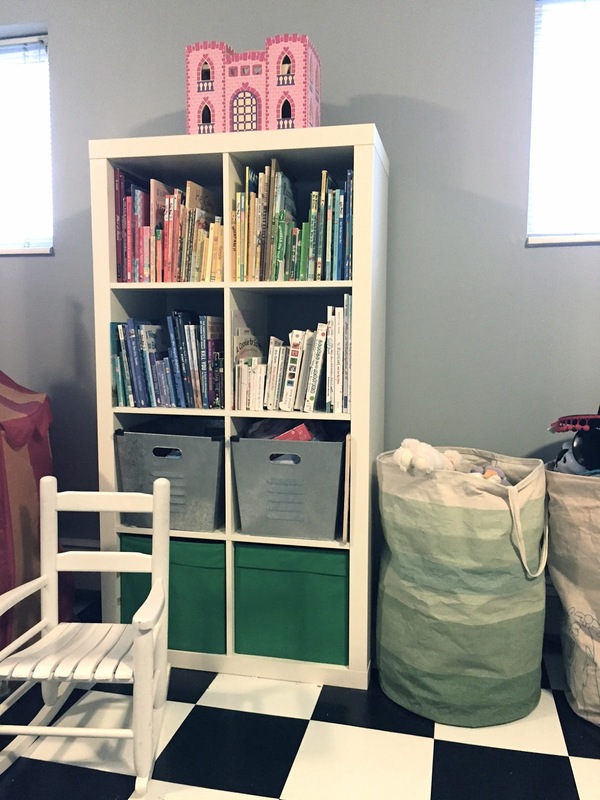 If you had an unlimited budget what 3 things would you have in your playroom tomorrow? 1- I would love better looking shelves and bins! 2- A set of comfortable kids sofas for the kids to hang out on. 3- A cool dress up closet full of great dress up clothes. What's your favorite place to shop for toys? Jet.com has good deals too. p.s. We are looking for play spaces of all shapes and sizes to share. If you are interested in sharing, please contact us.